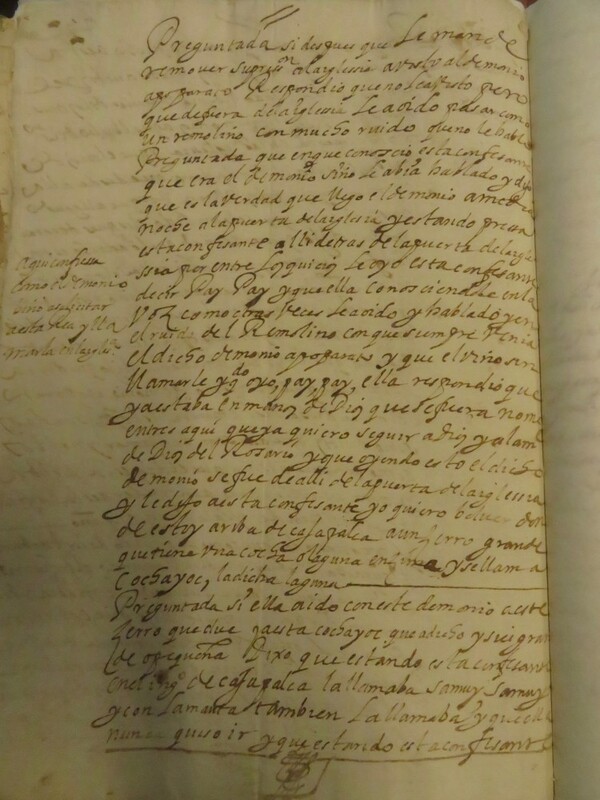 In the first week of March I set off for Lima, Peru, to visit the Archivo Histórico Arzobispal de Lima (Historical Archive of the Archbishopric of Lima) in order to search the ethnohistorical record directly for first-hand accounts of indigenous Andean religious specialists, who found themselves before the Spanish ecclesiastical courts charged with sorcery and idolatry. It is a quite extraordinary experience to have in your hands, original documents dating to the 17th century, covered with the scrawled, often nearly illegible handwriting of the court clerks of the day. It takes time, focus and patience to be able to decipher – slowly – the words you are reading. 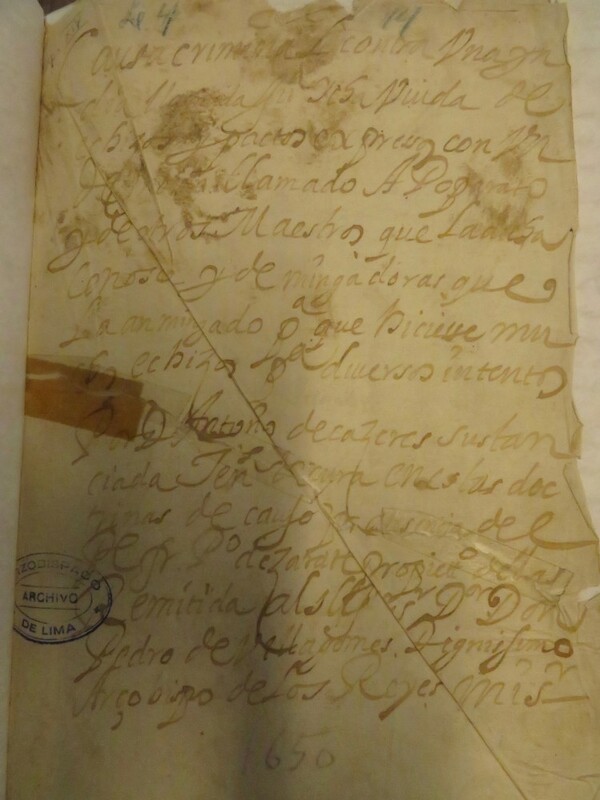 Fortunately, my earlier experience of working with original documents at Seville’s famous Archivo General de Indias gave me the confidence to persist, and little by little, the accounts of these people unfolded. Their words are heavily filtered: through the official court translator – from original Quechua into Spanish – from the framework of their own understanding of the metaphysical world they inhabited into that of the European Christianised framework and language of demonology and witchcraft. There are many accounts surviving of the prosecution of indigenous Andeans by the ecclesiastical authorities, many dating to the 17th and 18th centuries, but the account of one of them – Juana Icha – provides us not only with another example of the legal processes involved and the intellectual framework applied in such cases, but of something rather rarer, of the real psychological impact that forced conversion to an alien creed had upon the people being prosecuted. The presiding priest and prosecutor in this case was one Don Antonio de Cáceres and Juana Icha, referred to throughout as the ‘confessant’, the defendant. At the time of the trial in 1650, Juana Icha was 60 years old. She was a locally renowned curandera from the town of Pomacocha in the Caujo ecclesiastical jurisdiction of the Viceroyalty of Peru and considered very powerful, with the ability to divine, and to harm as well as to heal. Perhaps inevitably she had made enemies, including those who had brought her to the attention of the religious authorities and who testified against her. The first point of interest to note is that Juana Icha would have been born around 1590, a good generation following the Spanish Conquest in 1532. Certainly at this time more remote Andean regions would have likely been less exposed to the intensity of evangelist campaigns than in the main population centres and Juana Icha had evidently internalised from her earliest infancy the autochthonous Andean belief systems, centring upon huaca veneration. Her guardian spirit, or huaca was called ‘Apu Parato’, apus representing a particular kind of mountain deity. Following several forced confessions, we learn that Juana Icha had been imprisoned overnight in the church, when she heard the characteristic whirlwind sound of Apu Parato outside the door, calling her to join him. She responded for him to go away, that she was now in God’s hands where she wanted to stay, and, after attempting to induce her to follow him to his dwelling high upon the mountain above Cajapalca with a lake called Cochayoc on its summit, eventually, he left. However we interpret experiences of this nature, either in terms of the spiritually mystical or through conventional western biomedical mental health understandings which would more likely define this as a manifestation of ‘psychosis’, the cultural and psychological trauma is clearly manifest. There are many other similar cases discussed by authors such as Griffiths (1996) and Mills (1997) which clearly demonstrate the psychological process of ‘dissociation’, wherein the innate indigenous experience of the numinous and understanding of the nature of the cosmos were under direct assault by an invading alien system of beliefs which imposed alternative metaphysical constructs and associated rituals, including the active demonization of the indigenous Andean. Cáceres, the priest prosecutor, consistently and disparagingly refers to Apu Parato - Juana Icha’s guardian spirit - as “el demonio, Apo Parato, su amigo” - “The demon Apu Parato – your friend”. Mental health and well-being are critically dependent upon a stable sense of identity, at both personal and collective levels; these in turn impact physical health. Warfare (the wars of conquest by Spain), population displacement (the forced resettlement programmes called ‘reducciones’ introduced by Viceroy Toledo in the Andes in the 1570s), and the forced programmes of evangelisation to an alien religious doctrine all combine as significant stressors to indigenous populations already afflicted by successive waves of epidemic Old World diseases, to which they had no immunity. The objectives of MEDICINE include the construction of a framework of understanding into how indigenous Andeans adapted to these stressors and survived, and the extent to which their original belief systems and practices have survived with them. Apu: A pre-Hispanic concept meaning ‘Lord’ in Quechua. As the spirit inhabiting mountain peaks, the apu is the personification of the landscape. It functions as a tutelary deity, intervening directly in the material world and requiring propitiation through regular, formal offerings (Griffiths 1996:316). Huaca: a superhuman person, shrine, holy and powerful object (Salomon and Urioste 1991:16). In pre-Columbian and colonial times, a huaca was a "sacred entity" or 'object of reverence’. It has been described as “both a localization of power and the power itself resident in an object, mountain, grave, ancestral mummy, ceremonial city, shrine, sacred tree, cave, spring or lake of origin where festivities were held or where a great man lived." (Brundage 1963 In Griffiths 1996: 317). Griffiths, Nicolas. 1996. The Cross and the Serpent. Religious Repression and Resurgence in Colonial Peru. University of Oklahoma Press, Norman. Mills, Kenneth. 1997. Idolatry and its Enemies. Colonial Andean Religion and Extirpation, 1640-1750. Princeton University Press, Princeton, New Jersey. Salomon, Frank and George Urioste. 1991. The Huarochirí Manuscript. A Testament of Ancient and Colonial Andean Religion. The University of Texas Press, Austin. This blog entry was posted on Friday 7th April 2017.